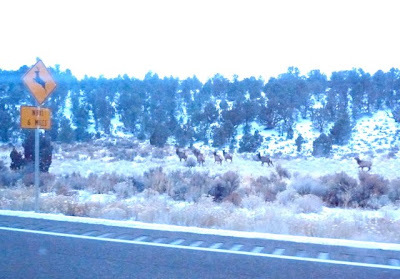 The highway department has recognized this area as a deer and elk crossing and even has it posted. If my photo came out better I would send it to them. 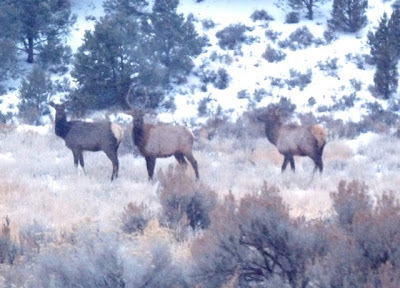 One of the most impressive things about elk is just how big they are. 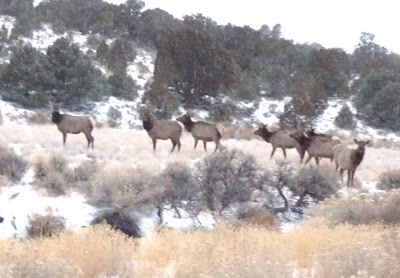 They are about double the size of mule deer, with elk cows (females) weighing around 500 pounds and mature elk bulls (males) weighing around 700 pounds. For more info about elk, click here. I call myself Desert Survivor because sometimes it takes some extra, or at least different, skills to survive out in the rural desert, an hour from the nearest grocery store, over two hours from the nearest Wal-mart, and in a place where the population hasn't increased in several hundred years. It's a great place to raise kids, where the whole world seems open to exploration. Manure piles, caves, tractors, and more await those who desire them. The air is clean, the views are spectacular, and the kids, cows, and dogs run free. Well, it seems that Desert Boy has learned a few lessons about how to survive in the desert. We've been working hard at getting him to sleep all night long in his own bed. 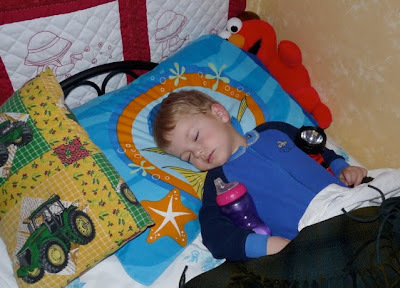 When I went in and checked on him the other night, I found that instead of cuddling with a stuffed animal or a special blanket, he had a bottle of water tucked under one arm and a flashlight under the other. I guess he's taking comfort to a different level. I couldn't resist snapping a photo and sharing it with you. 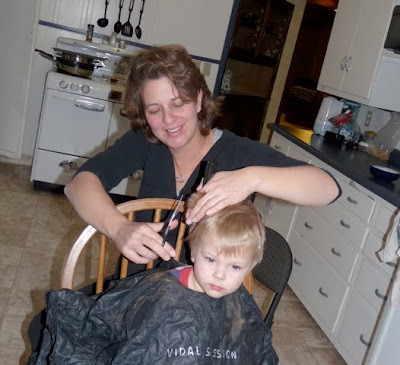 Desert Boy was looking a little unruly, and we don't have plans to take him to town anytime soon, so the other night it became haircut time in the kitchen. 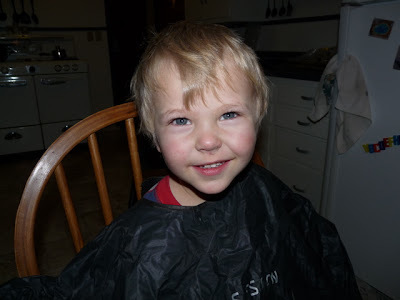 He finally decided it would be okay to have his hair cut, a necessary step to get him to sit (sort of) still. I didn't really know what I was doing except making it shorter, but at the rate his hair grows, it doesn't really matter. I figured as long as I didn't leave him with a mullet he would be okay. Desert Boy thought the whole process took too long, but at least he stayed seated. I also managed not to cut off any parts of his ears or make him cry, so I would say it was a success. It's nice not to have too high of expectations. Here's the final result. 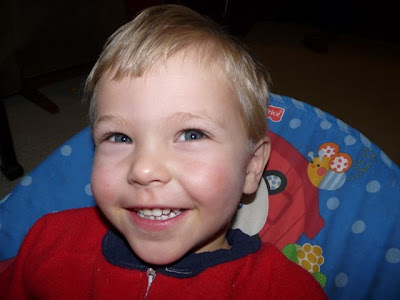 With a smile like that, it doesn't really matter what his hair looks like, does it?! We haven't been getting out and exploring the desert as much as I would like to this winter, but I did stop and take some winter photos the other day. 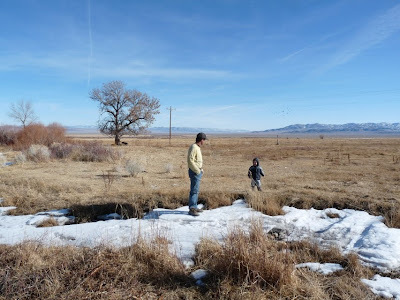 We haven't had much snow here this winter, it seems the storms dump as they go over the Sierra Nevadas and then split by the time they get here, either going north or south. So when we finally got a little snow last week, it became a winter wonderland. 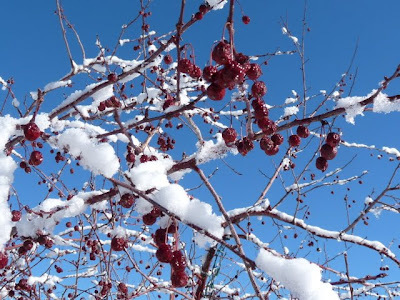 The birds are really enjoying all the trees that have berries left on them. I even saw a flock of cedar waxwings, which was a treat. I liked the symmetry of the outdoor amphitheatre at EskDale. During the summer we go to a Fourth of July celebration here. It's almost hard to imagine now. At the bottom of the amphitheatre is a basketball court. 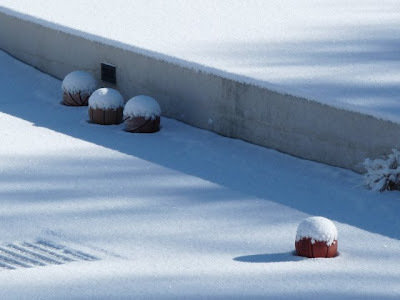 The basketballs look a little lonely right now. 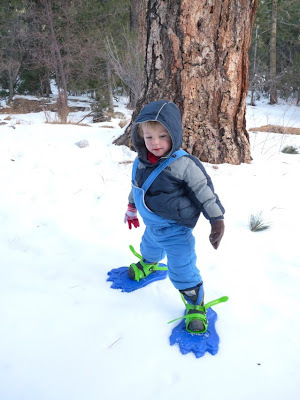 Our latest storm gave us even more snow, and Desert Boy and I had fun playing in it yesterday. We'll be heading out again today to make the most of us before the elusive desert precipitation disappears. Blogging has obviously not been my highest priority this last week, as will eventually be explained (but not today). I have some photos I need to post, and I'll try to get to them sooner rather than later. In the meantime, I just posted at Protect Snake Valley about what we did last weekend, so take a look! And we got our first decent snowfall of the year last night (it's only the end of January! 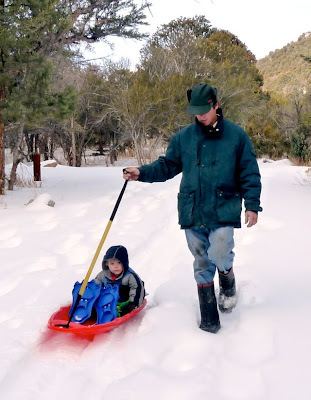 ), so Desert Boy and I are going to head out to make some dinosaur tracks and play in the sled. 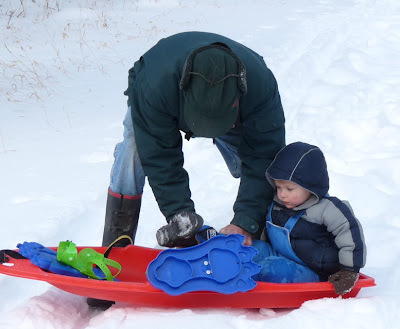 We are quite a bit behind on snowfall this winter, so hopefully we'll catch up in the next few months. Desert Boy really wants to make some snowpeople and snow animals and throw snowballs. 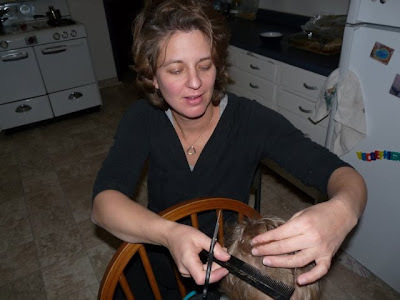 This weekend the Border Inn is hosting the seventh annual Sheepherder's Party. We went last night, and it was quite the kickoff, with a delicious dinner followed by great entertainment. I'll get some more photos posted soon. 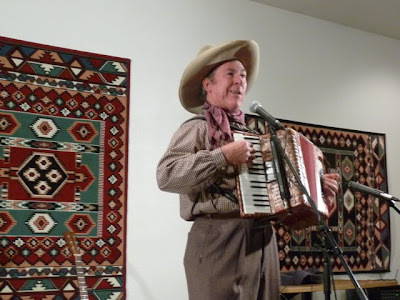 Sourdough Slim is back with his musical and joke repertoire and will be doing a special program at 2 pm today. For more info about the Sheepherder's Party, see this post on ProtectSnakeValley.com. 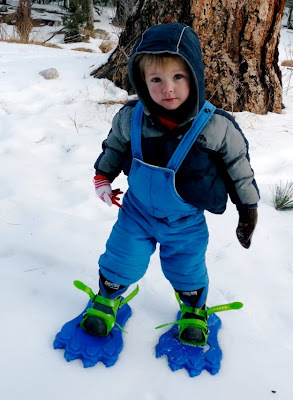 Desert Boy got his first pair of snowshoes this Christmas, and yesterday we decided to try them out. The valley is pretty much snowless, so we had to drive up to nearly 7,500 feet in the mountains to find some snow. 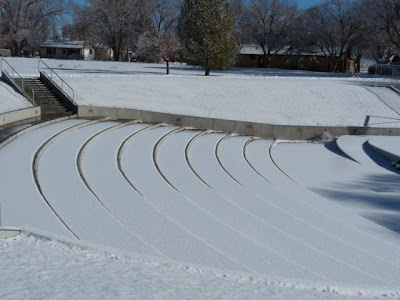 Unlike our friends and family in other parts of the country, we've been having a snow drought. We want some snow! 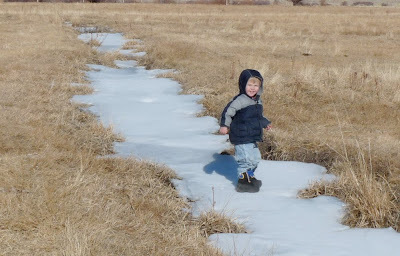 The snow was a bit crusty, so there wasn't much give when Desert Boy walked on it. The flip side was that he didn't sink in. 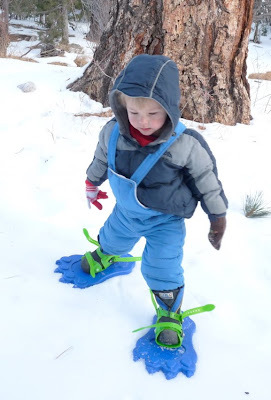 He did quite well for a first time snowshoer, not tripping too much. 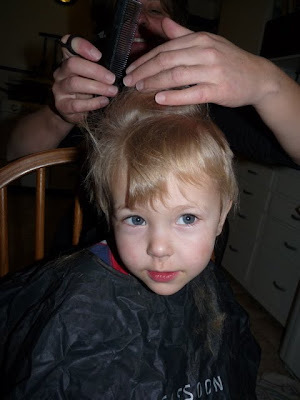 Of course it helped that most of the time Dad was on one side and Mom on the other. Stomp, stomp. The tracks didn't come out too great, but we'll try again. 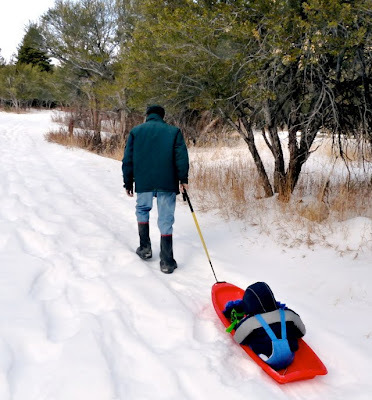 Eventually it was time for Desert Boy to get a ride on the sled. Even dinosaurs get tired. 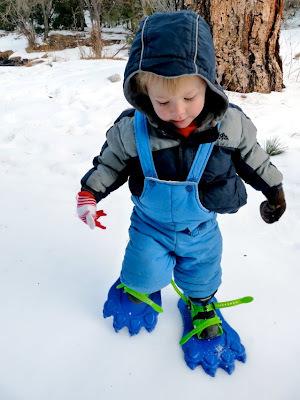 He didn't want to take his snowshoes off. They look really big when he sits like that! But eventually his boot fell off. And then he fell out. And then he got cold. And then it was time for the dinosaur to head back down to a lower elevation and warmer weather. It's not easy being a dinosaur! 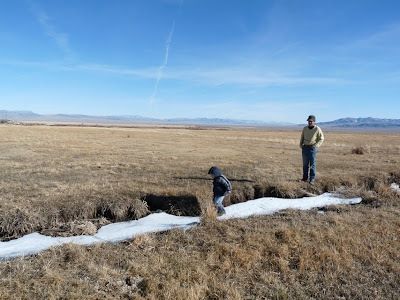 We discovered that although the snow has melted off the meadows near our house, the ditches are still full of ice and snow. 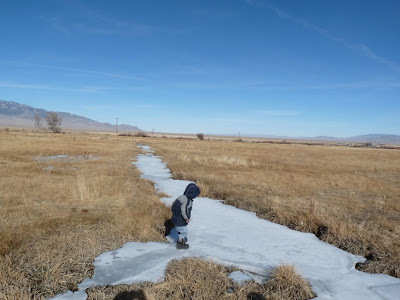 Desert Boy thought the ice was really cool and couldn't wait to go walking on it. 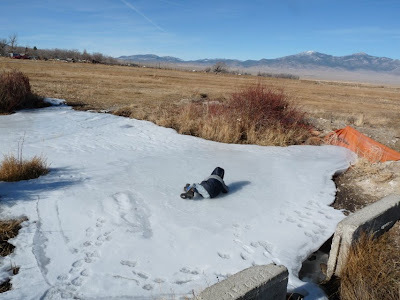 Since there's no water running under the ice, we knew it would be safe for him to slide along. 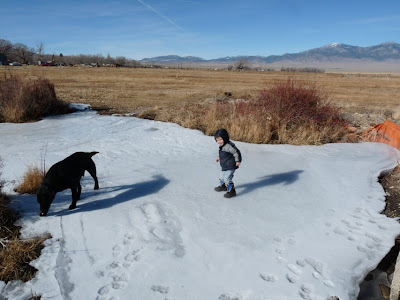 The slippery ice was instant fun. Desert Boy says, "Follow me!" He liked it when the ice cracked under him. You can see how dry everything is--we've had a dry winter so far. 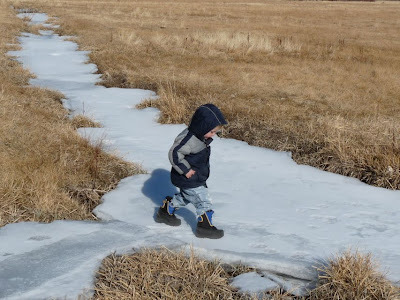 Then we got to a patch of slippery ice and Desert Boy pretended he was an ice skater. Complete with falling down! It's fun to enjoy the simple things of life. When we need a break from the winter weather and Desert Boy still has plenty of energy (a common occurrence), we head over to the upper shop. 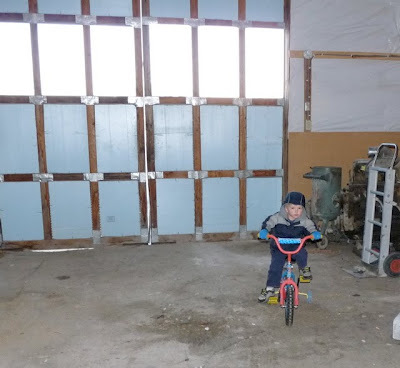 He has his bike over there and that's one spot that has a flat, even floor. 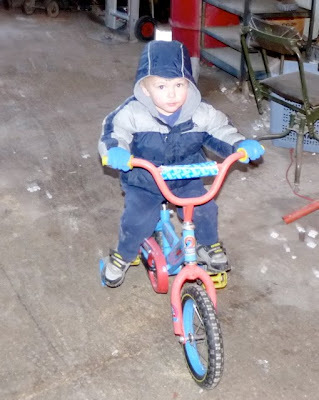 He's recently improved his pedaling quite a bit so he can ride around in circles in the open bay and then around the chopper and balers. Although turns can still be a little tricky. 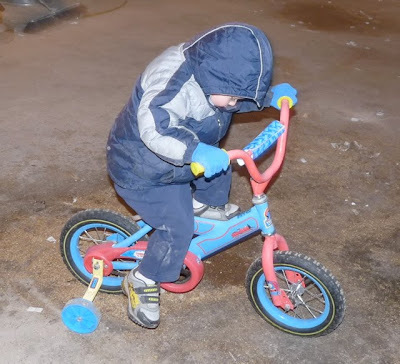 Hopefully by the time it starts warming up he might be ready to try some of the gravel roads.